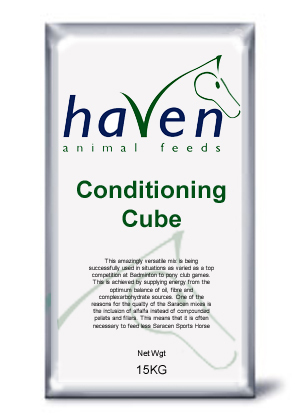 Haven Horse & Pony Conditioning Cubes is the most popular and effective fully balanced conditioning feed on the market. Barley-free and based on micronized wheat, the cubes are non-heating and highly digestible and are renowned for restoring lost condition without blowing horses’ minds. They provide excellent quality protein, which is vital for developing muscle tone and real top line, as well as soya oil for coat condition and as an additional source of slow release energy. Their effectiveness means that weight gain can be promoted without having to resort to excessive volumes of hard feed, helping to avoid the associated digestive risks. Full feeding recommendations are on the reverse of the sack.